The other day I shared a look on Instagram which was totally inspired by a british theme (I had just come back from London xD). Since I liked it so much and it was completely impossible for us to take pictures that day (and I didn't really felt like repeating the look), I ended up creating this one...Similar, but not the same. I really like this skirt with the wellies! and the scarf ir totally protagonist in this outfit without doubt. Gosto tanto da tua criatividade e destreza para dentro do teu estilo conseguires recriar vários estilos diferentes sempre com um resultado espetacular! Love the scarf, great look! Scarf is perfect, and wellies, ooooooh, love it =). I am sad that I see them so less in cities..they are great to the weather like this..
And British looks are definitely your thing! ;) Love every single detail! Estas preciosa, me gusta la falda!! Lovely scarf! Great look, love that you styled everything with a skirt! Adorei o outfit, as fotografias na ficaram super bem !!! venho cá vê-las todos os dias. 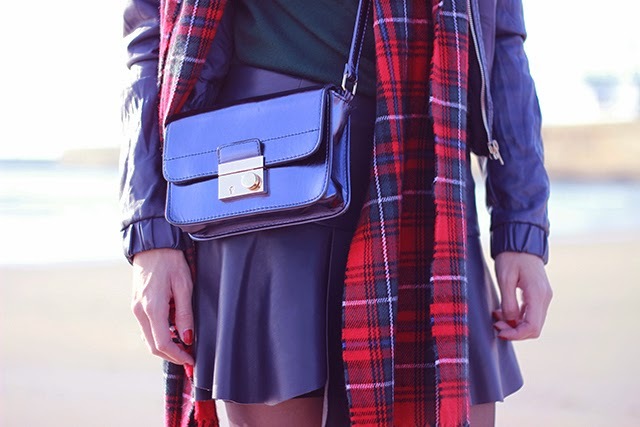 Love how you add the plaid scarf to this look. Cute. Gostei muito do look, realmente com um toque british! :) o cachecol é muito giro e parece tão quentinho! E a saia e as botas ficam super bem! Estas tão gira!!!! Adoro a saia e a carteira! As fotos estão muito bonitas!!! Adorei o perfil de Natal do blog, está lindo!!!! Opah tão gira que estás. =) Gosto muito da saia. Que gira :) Gosto imenso do look.